All prices have taxes included. Delivery/shipping: if you order up to 7 packages delivery cost will be 6.50 €; if you order 8 packages or more delivery is free. 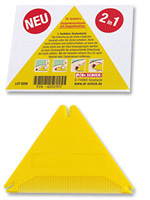 For the easy and safe removal of ticks use the Dr. Schick Tickcard comb.